Bill Shorten has reaffirmed Labor’s support for a new Aboriginal “Voice to parliament”, promising a referendum to enshrine it in the constitution if Labor wins the election. This is another piece of symbolism that will do nothing to address ongoing oppression, poverty and racist government policies. 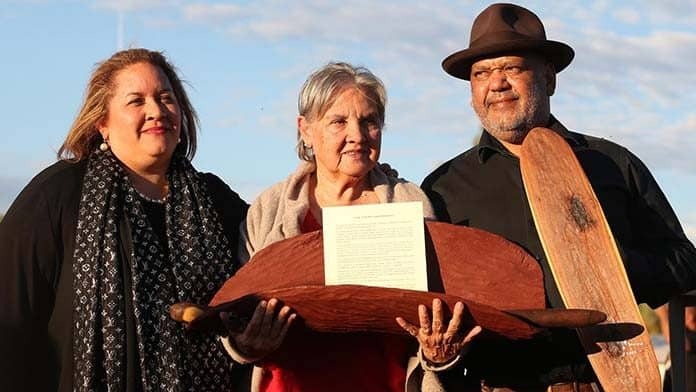 The “Voice” proposal was originally developed by conservative Indigenous lawyer Noel Pearson in 2015, to try and rescue a failing, government backed campaign for constitutional recognition. The “Voice” was presented as a major “structural reform” by the Referendum Council set up by Malcolm Turnbull, a remedy to the “torment of powerlessness” faced by Indigenous people. But to placate conservative politicians and the corporate sector, the proposed constitutional details of the “Voice” stipulate it will be a toothless advisory body that could be dismantled at a stroke by the government of the day. Malcolm Turnbull originally supported the proposal. But following the “Uluru statement from the Heart” in May 2017, which the Referendum Council claimed as a mandate for their advisory Voice model, Turnbull rejected it as a “third chamber of parliament”. He was under pressure from a push against the Voice by Abbott, trying to cohere the hard right of the party for a leadership challenge. A series of “dialogues” leading up to the constitutional convention near Uluru consistently rejected tokenistic constitutional change, demanding real power for Aboriginal communities to control their own affairs and a process for negotiating treaties. Some delegates walked out of the Uluru convention, saying it had been set up to ratify Pearson’s proposal. Many other delegates who stayed believed the “Statement from the Heart” was a call for far more profound power than that on offer from the Referendum Council’s Voice model. But a recent parliamentary committee, which delivered a report in November supported by Labor and Liberal representatives, accepted without question that the Voice would simply “serve to advise the Parliament” and would not have “any form of veto power”. The government would determine how the Voice to parliament worked, and could also dissolve, defund or replace it, simply by passing legislation. One submission, from Aboriginal members of the Referendum Council, even argued there should be no legally enforceable obligation on government to consult the body. The Voice would simply, “rely upon political respect from… the Parliament and the Executive”. But when has the government ever shown respect for the aspirations of Aboriginal people? A series of advisory bodies have been set up since the 1970s, then ignored and discarded. The Whitlam government established the elected National Aboriginal Consultative Committee (NACC), only to see it shut down and replaced by the Fraser government a few years later. Then came the National Aboriginal Conference (NAC). It was pushed aside by the Hawke Labor government as soon as it objected to weak proposals for land rights legislation. Finally the Aboriginal and Torres Strait Islander Commission (ATSIC) was dissolved in 2005 by the Howard government with the support of Labor. A body with real funding and the powers needed to allow Indigenous communities to control their own lives is badly needed—but not on offer through this process. Aboriginal communities face desperate and worsening poverty and oppression. Racist child removal policies have seen the number of Aboriginal children in out of home care explode, doubling since the Apology to the Stolen Generations just over ten years ago. Aboriginal children are ten times as likely as others to be removed and new forced adoption powers in NSW would make it impossible for children to be returned. The massive loss of jobs and control through the NT Intervention and associated policies since 2007 has driven communities into the ground. The river crisis in NSW has left many without clean drinking water. Many other communities nationally are forced to drink bore water with heavy metals, or poisoned by industry. Nationwide, Aboriginal people are locked up at obscene and rapidly rising rates, accounting for 28 per cent of adult prisoners despite being just 2 per cent of the population. This has been driven by a return by governments to a more openly punitive and assimilationist approach. It will take a return to the fighting mass Aboriginal rights movements of the past to push back the racism.